Imagination Library partners and sponsors took the first week of Spring to visit Head Start Centers across Knox County and read during the Very Hungry Caterpillar Birthday Celebration Week! Approximately 160 children were read to by a guest reader—several of them got to host more than one guest. The kiddos loved hearing the story all week (except one little guy who told the guest reader that he liked the story “only ONE time”). 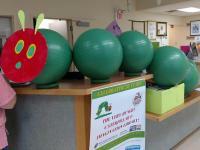 Close to 100 parents attended classroom events and participated in Hungry Caterpillar related activities. One parent shared the following story: Nik tells me about the Very Hungry Caterpillar every day now when we make dinner. He likes to plan the dinner menu around what the caterpillars like to eat. He also likes to exclaim, “My tummy is so hungry, like the caterpillars! I need all the food!” We have set a family goal to find some caterpillars this spring and watch them turn to butterflies. He LOVED the story!! Head Start classes are continuing to study caterpillars and butterflies and many of them have gotten their own caterpillars to watch as they change into butterflies. Keep watching Head Start’s Facebook pages to see their progress! Pictures are also available at United Way of Knox County Ohio Facebook Page. Thank you for continued community support of United Way’s Imagination Library program. Our numbers remain solid at 1,900 children receiving books each month. Please continue to recruit Knox County families with young children under age 5 but referring them to uwayknox.org or imaginationlibrary.com to get registered.